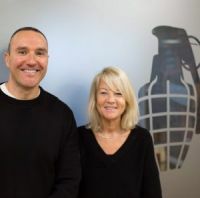 The night's big winners were Alan and Juliet Barratt, the husband and wife co-founders of active nutrition brand Grenade®, who were named the National Great British Entrepreneur of the Year for 2018. This follows their regional wins for Birmingham in the categories ‘Great British Entrepreneur of the Year' and ‘Scale-Up Entrepreneur of the Year' at the regional finals in November 2018. "It's an honour to be named National Great British Entrepreneur of the Year. Since launching Grenade in the midst of the recession, we have had to overcome several significant challenges. The award is the result of years of hard work and dedication, and this award is a vindication of the efforts that the team and Juliet and I have put in. "This year's competition in both the regional and national awards was fierce, and it's a privilege to have been named among such prominent entrepreneurs. We're now looking forward to building on Grenade's success and growing the brand even more in 2019. "Throughout the year and beyond, we will continue to promote our snacking revolution campaign, helping people make healthier food choices as part of an active lifestyle. We are also planning to expand Grenade's presence on the global stage, supported by the opening of our new offices in Dubai." "Alan and Juliet join a fantastic group of entrepreneurs who have been named Great British Entrepreneur of the Year, and they're thoroughly deserving of the title. They are truly amazing entrepreneurs, and have that added unique bond of going through this journey as husband and wife. "What they have achieved so far is nothing short of remarkable, and I can't wait to see what Grenade does next." "NatWest is proud to support the Great British Entrepreneur Awards, celebrating another year of amazing achievements for entrepreneurs and start-ups from every corner of the country. Supporting entrepreneurs is a key priority for NatWest and our dedicated programme of free mentoring, insight and bespoke coaching, is specifically designed to meet the needs of entrepreneurs who want to grow and scale their business. Congratulations to everyone who has made it to tonight's National Winners Evening."